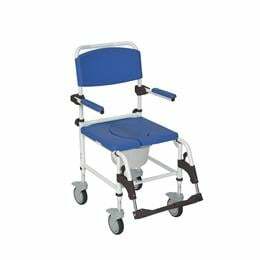 The Aluminum Shower Commode Chair is perfect for people who need a commode but also want the convenience of a wheelchair for easy transportation and mobility. The chair comes with two rear locking casters to provide safety when the user does not need to be moved. The seat cut-out provides comfort and allows the chair to be positioned over a standard toilet for use, but also comes with a bucket to be used anywhere it is required. The aluminum frame of the Shower Commode Chair is an attractive white color and is also resistant to rust which makes it ideal for the shower. Footrests come standard and include adjustable height and angle footplates. The Aluminum Shower Commode Chair is ideal for anyone who is looking for a shower chair and commode for their home. Floor to seat height can be adjusted 4" without tools.